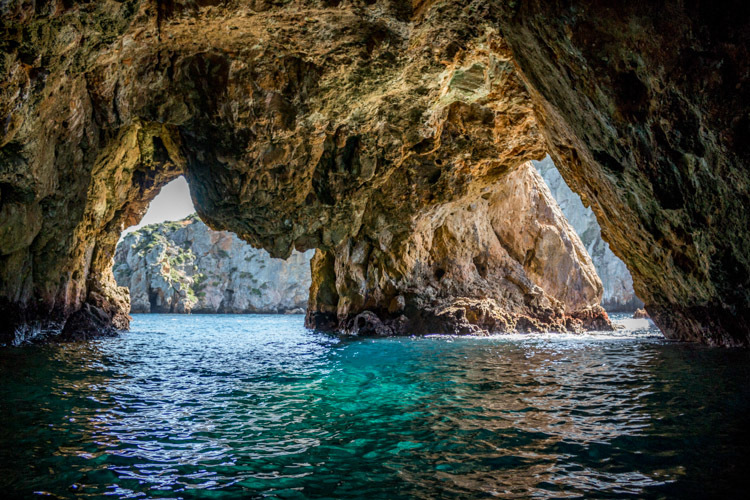 Are you ready to embark on the journey of a lifetime? 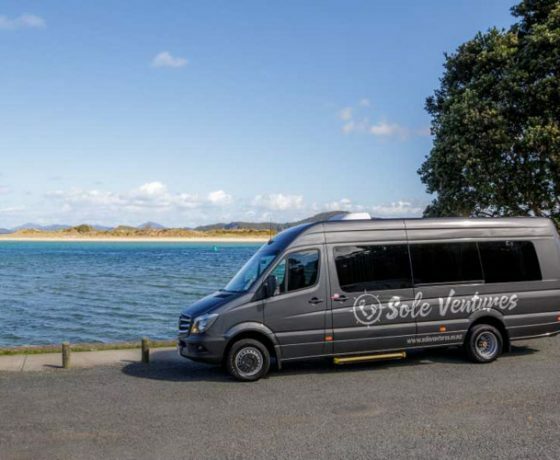 At Sole Ventures we explore New Zealand’s breathtaking natural environment, from the ocean floor to the mountain peaks, inviting you to come along on a journey with us guiding you through some of the most stunning locations of Northland, New Zealand. 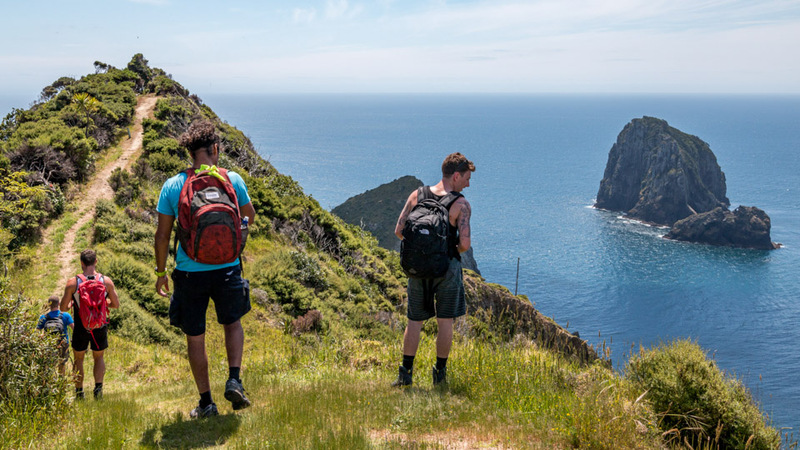 Sole Ventures is a New Zealand company started and operated by two adventure loving Kiwi brothers, who know New Zealand intimately and want to share it with you while providing the legendary Kiwi hospitality that New Zealand is famous for. 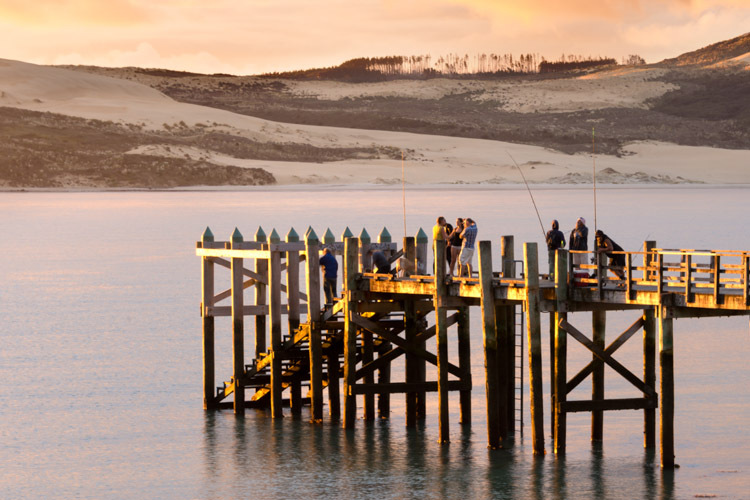 Sole Ventures A truly unforgettable Kiwi experience! 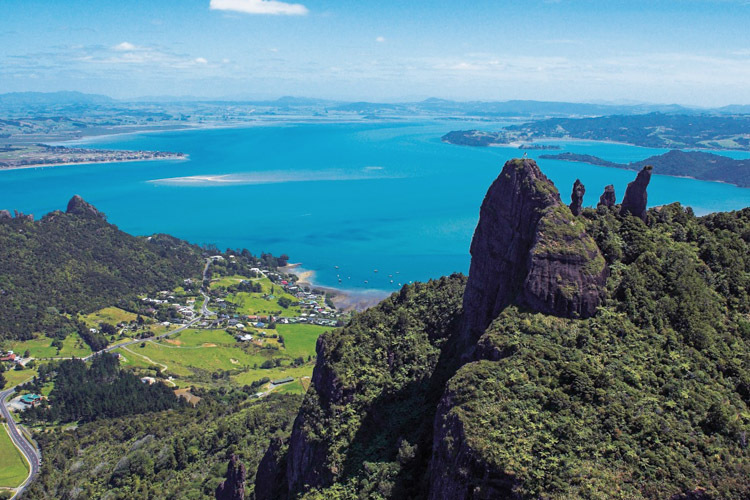 Check out our tours departing from Whangarei and start planning your Northland adventure today! Browse through our gallery to get a taste of the awe-inspiring locations we travel to, after all you know what they say – A picture speaks a thousand words. 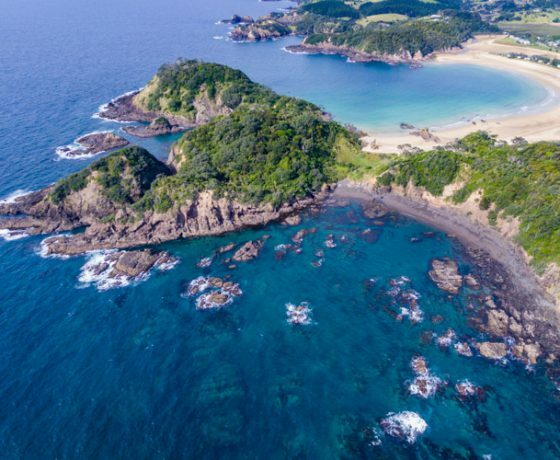 The stunning Tutukaka Coast has been rated as one of the top 3 costal destinations in the world by National Geographic, and it’s easy to see why! 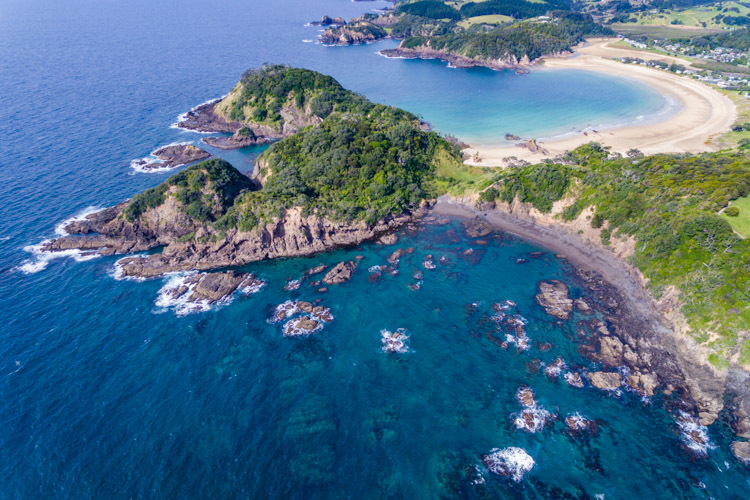 With the Tutukaka Coast Discoverer, you will explore the best of the Tutukaka Coast, discovering pristine beaches, sheltered bays, stunning native bush and much more! 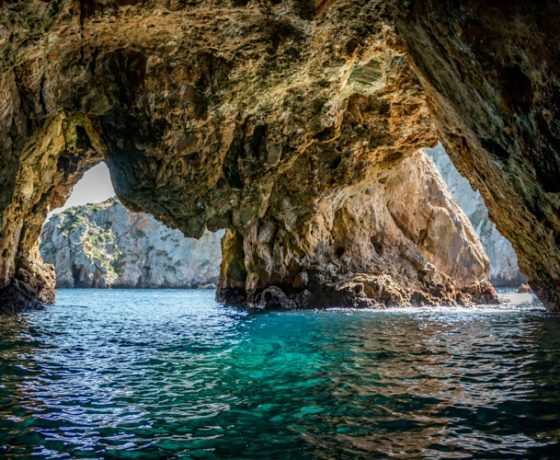 If you are in the area, do not miss out on the opportunity to take in this pristine coastline and enjoy all it has to offer. 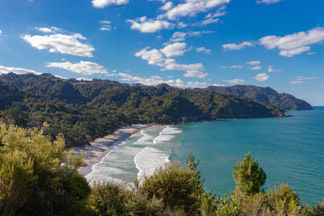 Our first stop is the famous Matapouri Beach, regularly named as one of New Zealand’s best beaches, this stunning white sand beach is protected by a narrow entrance that creates a lagoon like feel to the bay. This means we can always find shelter here and it makes for idyllic swimming conditions protected from the wind and waves! From here we will make the short trip to one of our favorite lunch spots depending on what the conditions on the day are like. We will then make a short walk down to Whale Bay to explore one of New Zealand’s most stunning beaches, hemmed in by native bush and only accessible by foot or boat, this Bay is not to be missed! 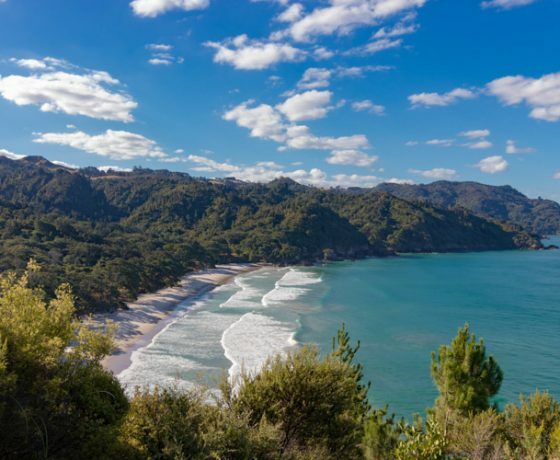 Our last beach for the day will be Whangamumu, here you have the option of relaxing on the protected beach, or enjoying a short coastal walk to take in the view of the Ngunguru Sandspit and Estuary before we head back to Tutukaka or Whangarei. This itinerary is intended as a guide only, and may be changed to better suit the conditions on any given day. 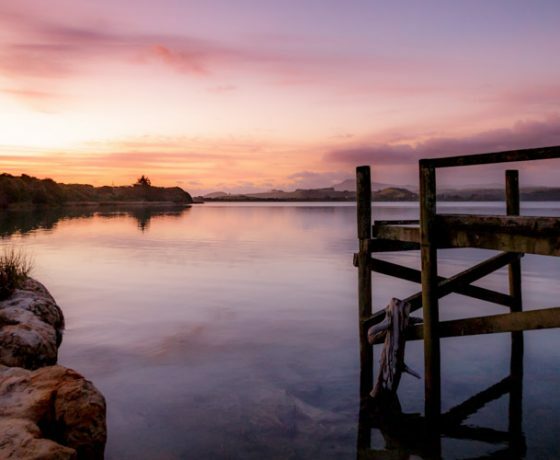 Whangarei Heads is one of Northland’s more out of the way locations, this beautiful area offers towering volcanic peaks, white sand beaches, hidden coves and untouched native bush. 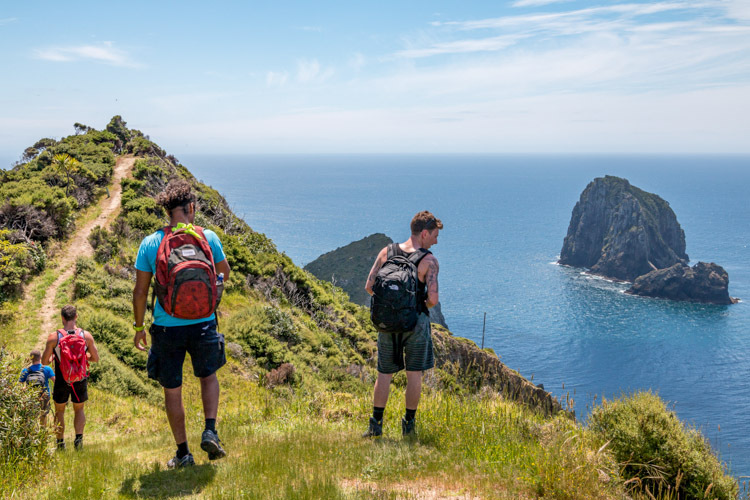 During the Whangarei Heads Roamer, you will explore a little of everything, from walking up Mount Mania to take in the stunning views to relaxing on the sheltered Smugglers Bay and picnicking at one of Northland’s more popular surf beaches, Ocean Beach. After meeting and departing from Whangarei or Tutukaka we will travel to Whangarei Falls, this impressive waterfall stands at 26m tall and can be viewed from the top or you can make the 10-minute walk to the base of the waterfall where you will find a picturesque pool surrounded by native bush and the waterfall cascading into it. From here we will travel to Mount Mania and make the climb to the summit! 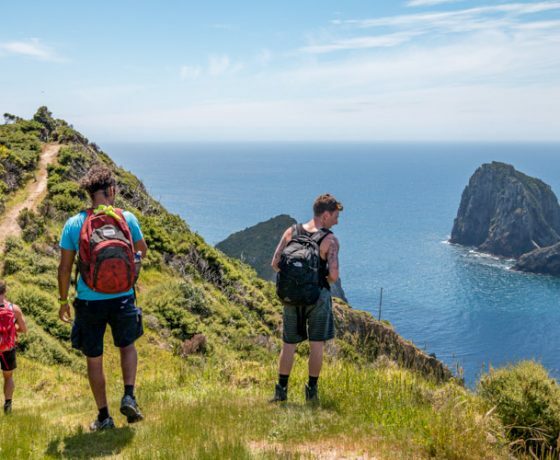 This is rated as one of New Zealand’s 15 great short walks, featuring volcanic pinnacles, beautiful native bush and stunning views over the dramatic Whangarei Heads and the Hen and Chicken Islands. 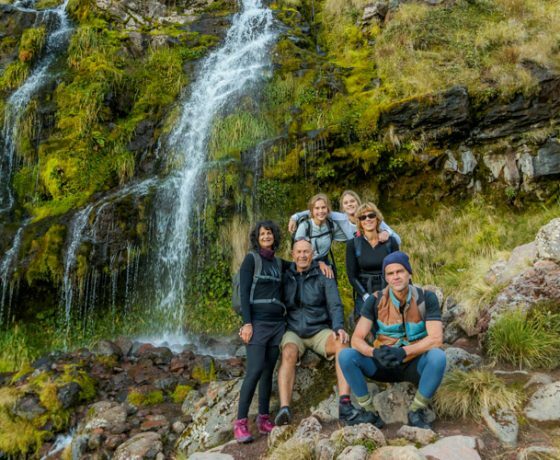 This walk is suitable for most walkers, while it is a steady climb, it’s worth every second for the breathtaking views from the top! Next stop is Ocean Beach where we will enjoy a picnic lunch overlooking the stunning Beach and its surrounding coastline. Ocean Beach is a well-known surf beach that also offers a number of short coast walks for those that are feeling active! Our last stop is Smugglers bay, an idyllic white sand beach that faces south down the coast and is often sheltered from the wind and waves. Accessed by a 20-minute walk it can only be reached by foot or boat so it is not uncommon to be some of the only people on the beach! From here we will make our way back to Whangarei/Tutukaka with time to relax before dinner. 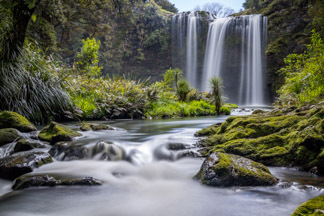 We will depart Whangarei or Tutukaka and make the short drive to Whangarei Falls where you can view the impressive 26m waterfall from the top or make the 10-minute walk to the base. 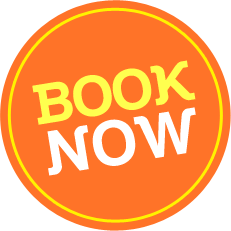 After departing the falls, we will travel to the Kawiti Glow Worm Caves to enjoy a 30-minute guided of the Caves to view a breathtaking display of glow worms overhead and experience these creatures up close and personal. Next stop is Opononi! 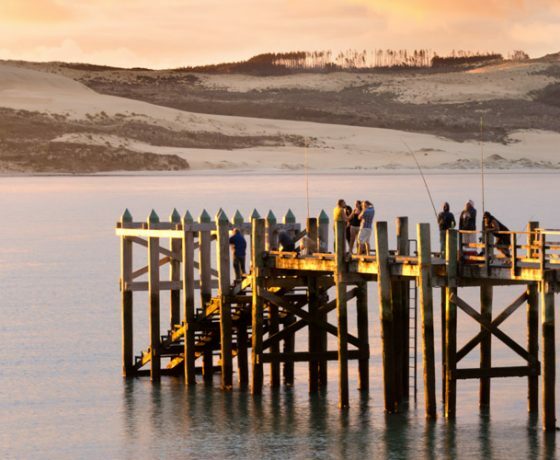 This beautiful harborside town offers views of the Hokianga Harbour and the towering sand dunes on the far shore, here we will enjoy lunch at one of the local cafes. 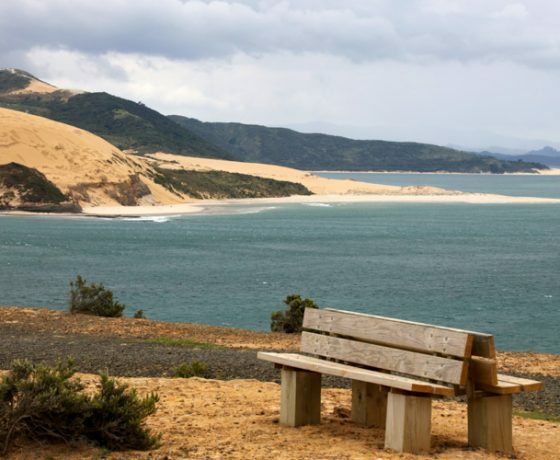 After a short headland walk to view the Hokianga Harbour entrance and the impressive views up and down the coast, we will make our way toward the beautiful Waipoua Forest. 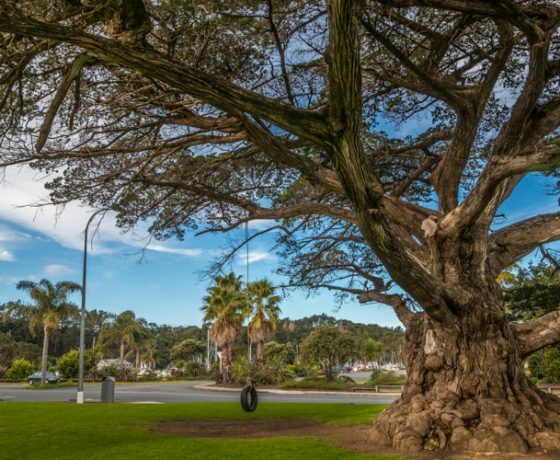 It is here where we will visit one of New Zealand’s iconic natural wonders, Tane Mahuta is our largest know Kauri tree, this behemoth towers at 51m tall and has a girth of nearly 14m. Estimated to be between 1250-2500 years old, Tane Mahuta is a significant part of Maori Culture. 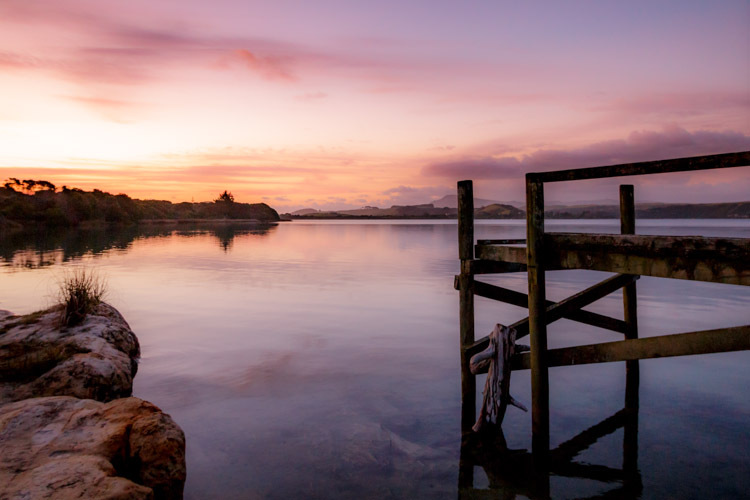 Continuing south we will reach the Kai Iwi Lakes, this series of fresh water lakes were created more than 1.8 million years ago and are surrounded by stunning sandy beaches and provide a well-deserved swim after a day of exploring! Once we depart here we will make our way back toward Whangarei and Tutukaka. 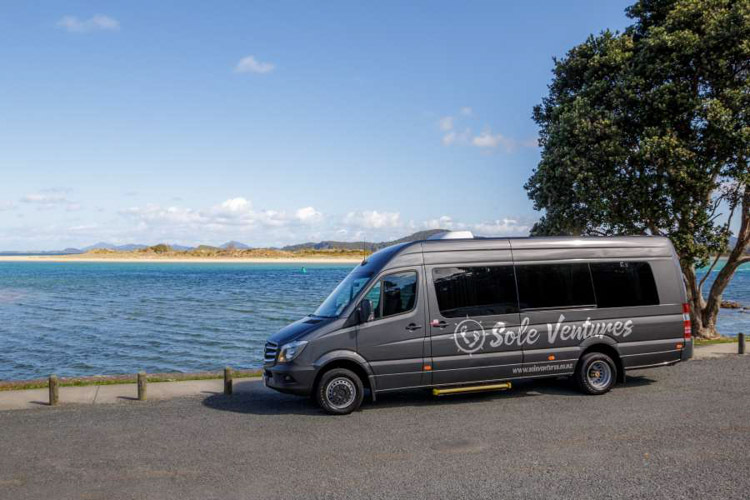 Sole Ventures – Bay of Islands Adventurer. 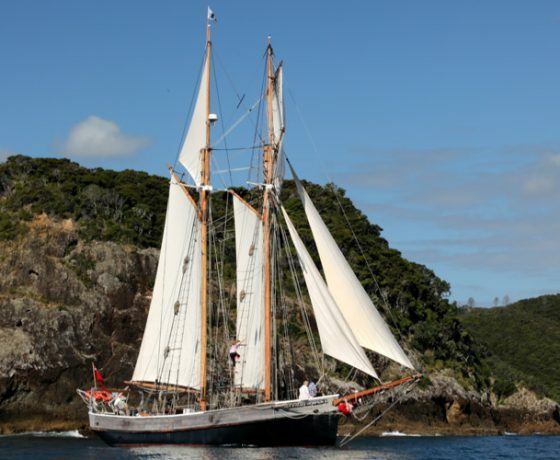 The Bay of Islands Adventurer enjoys one of New Zealand’s most iconic locations, you will experience local Maori Culture and some of our most important history, explore the beautiful waterfront town of Paihia and the historical township of Russell before ending your day with an authentic tall ship evening sail on the R. Tucker Thompson. 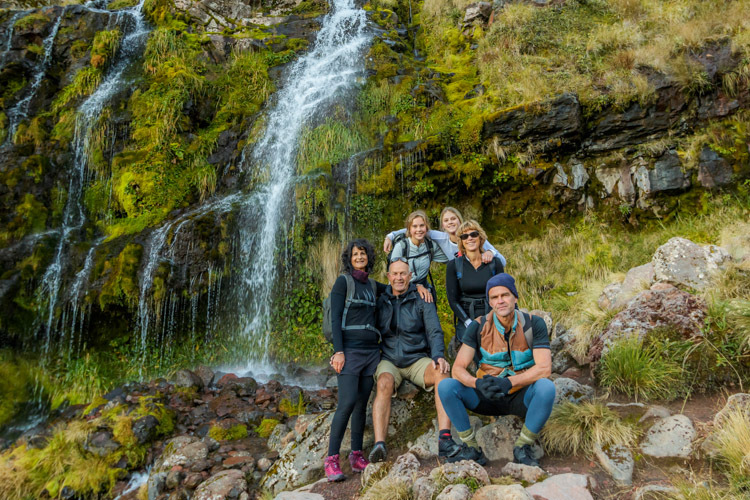 There is also opportunities for sightseeing and exploring some of our incredible natural features around the Bay of Islands such as the Haruru Falls! 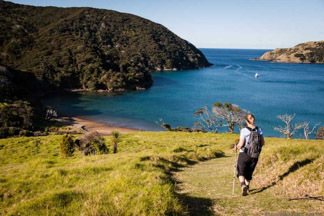 After meeting and departing from Whangarei or Tutukaka we will make our way toward the Waitangi Treaty Grounds, one of New Zealand’s most significant cultural and historical sites. 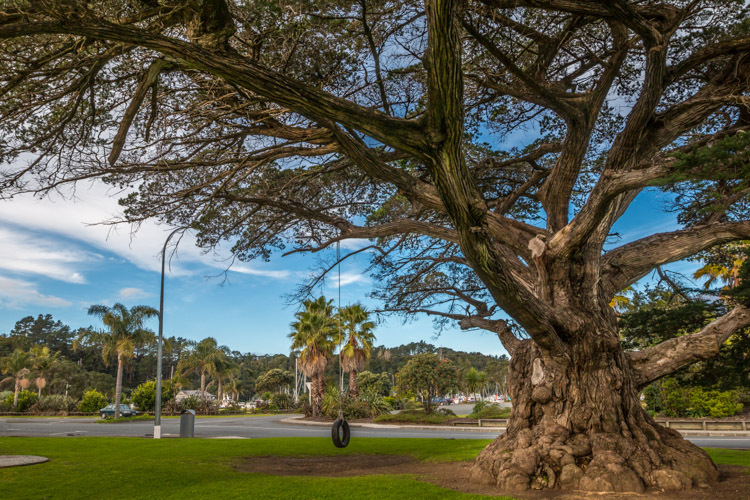 Here you will discover the wonders of the Waitangi Treaty Grounds through a guided tour before enjoying an authentic Maori Cultural Performance, before we head into the beachside town of Paihia for lunch on the waterfront. 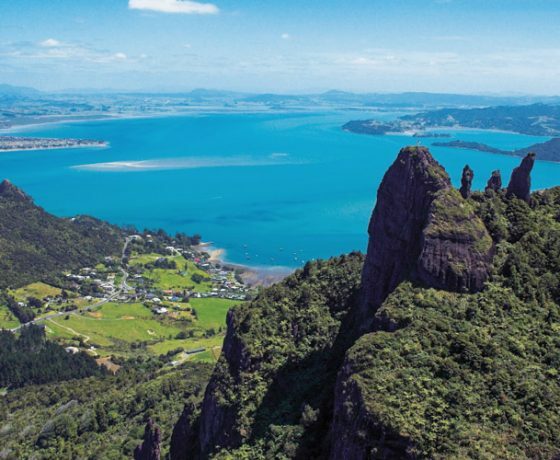 After lunch, you can explore Paihia under your own steam, or jump in the coach for the short trip to the iconic horseshoe shaped Haruru Waterfall. 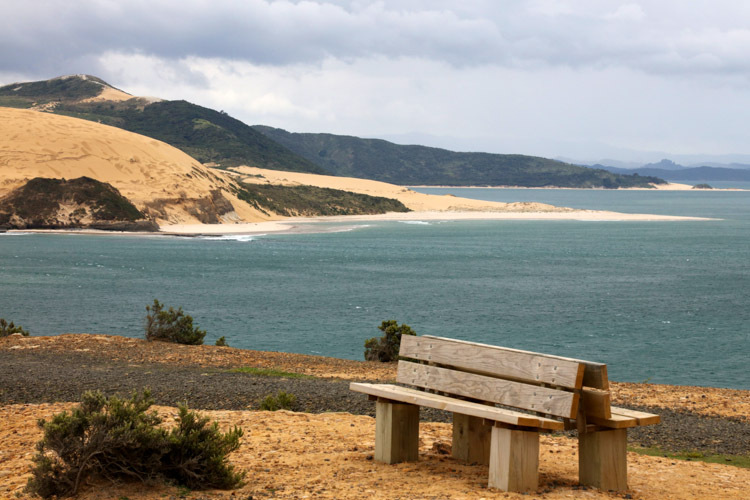 We will then catch the ferry over to Russell, New Zealand’s first capitol, here you will have a short time to enjoy the idyllic township or simply sit and have a coffee while you enjoy the view. 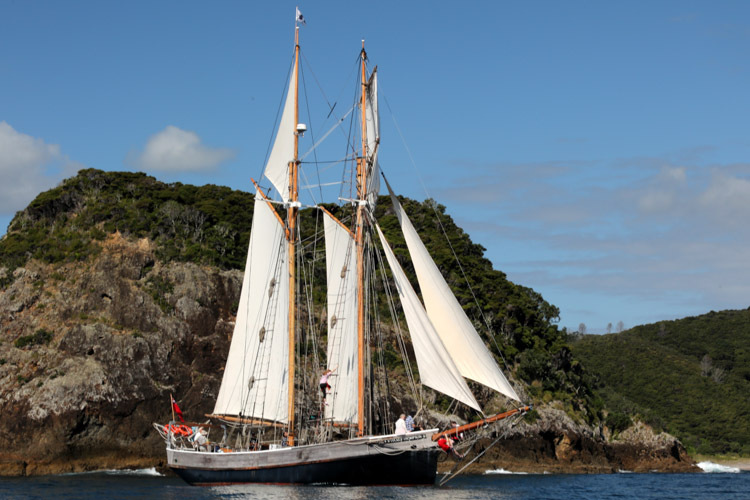 We will then board an iconic New Zealand vessel, the R. Tucker Thompson, this traditional gaff-rigged schooner operates as a youth training vessel during winter and during summer takes visitors out to explore the Bay if Islands. 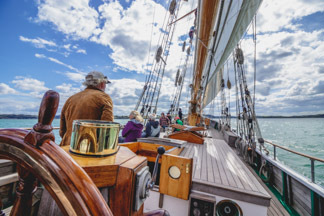 You will enjoy a 2-hour sail from Russel where you can help sail the ship, or simply sit back and enjoy a glass of wine and nibbles. After enjoying your evening on the water, we will catch the ferry back to Paihia before returning back to Whangarei and Tutukaka in time for dinner!